The ability of specific bone marrow cells to proliferate slowly and adhere to plastic was first described in the early 1970s (PMID: 4455512). Named colony-forming-unit fibroblasts (CFU-Fs) because of their spindle-like morphology, these cells showed nonhematopoietic differentiation potential. Eventually, the cells became known as mesenchymal stem cells or mesenchymal stromal cells (MSC) and a set of minimal defining criteria were established in 2006 to accelerate new discoveries and facilitate data comparability and development of novel cellular therapies (PMID: 16923606). MSC research focuses primarily on the cells' potential to influence the immune system and their capacity to regenerate tissue. MSCs are also one of the most prominent adult stem cell types being investigated for cellular therapies. In 2018, 757 clinical trials were in process worldwide, exploring applications like the treatment of autoimmune diseases and tissue regeneration (source: clinicaltrials.gov). Bone marrow was the first established source of MSCs (PMID: 4455512) and has been the primary and therefore most investigated population. Over the last few years, however, additional sources of MSC have been identified, from adipose tissue–derived MSCs (AT-MSC) to birth-associated MSCs, which includes sources like umbilical cord blood (UCB-MSC), umbilical cord tissue (UC-MSC), placenta (PL-MSC), and amniotic epithelium (AM-MSC) (PMID: 23278600, 16410387). Miltenyi Biotec has created dedicated applications for the isolation, expansion, and analysis of MSCs. Bone marrow is commonly aspirated from the sternum or iliac crest, or can be taken from other bones during orthopedic surgeries. Adipose tissue can be obtained from cosmetic surgeries as liposuction material or as solid tissue. These tissues might need to be dissociated into a single-cell suspension for many downstream applications, including isolation of cell subpopulations, cell culture, or flow cytometry analysis. For details, see chapters umbilical cord blood and adipose tissue. Miltenyi Biotec has developed several products for the straightforward magnetic separation of MSCs. In addition, generic protocols are available for indirect separation of MSCs using Anti-Biotin or Anti-Flurochrome MicroBeads in combination with biotin- or flurochrome-conjugated antibodies. The CD271 MicroBead Kit, human was developed for the positive selection or depletion of cells expressing CD271 (LNGFR). They are ideally suited for the isolation of CD271+ MSCs from human tissues, including bone marrow and lipoaspirate, but have also been successfully used to isolate MSCs from bone marrow of monkey, goat, dog, pig, and sheep (PMID: 20367498). Enrichment of CD271+ MSCs from bone marrow mononuclear cells (BM-MNCs). MSCs were isolated using the CD271 MicroBead Kit, human, an MS Column, and a MiniMACS™ Separator. Cells were stained with CD271 (LNGFR)-PE and CD45-FITC antibodies and analyzed by flow cytometry using the MACSQuant® Analyzer. The Anti-MSCA-1 (W8B2) MicroBead Kit, human is based on the antibody clone W8B2, which recognizes the mesenchymal stromal cell antigen-1 (MSCA-1), a highly specific marker to isolate MSCs with a high proliferative potential from bone marrow . Separation of MSCA-1 (W8B2)–positive MSCs from human bone marrow mononuclear cells (BM-MNCs). Combining the Anti-MSCA-1 MicroBead Kit, with two MS Columns and a MiniMACS™ Separator, the highly proliferative population of MSCs was isolated from other mononuclear cells. Staining was done with Anti-MSCA-1 (W8B2)-APC and CD45-FITC. Large-scale isolation and expansion of MSCs from human bone marrow is time and resource intensive. Success of this procedure depends on the quality of the starting material, and thus it is important to quantify the MSC content of the bone marrow. The number of MSCs in human blood source material is commonly determined based on the colony-forming–unit fibroblast (CFU-F) assay. However, the underlying process is time consuming and susceptible to serum lot variation, plating densities, and the subjective definition and scoring of colonies. It was shown that the Anti-MSCA-1 (W8B2) antibody exclusively detects CD271 (LNGFR)bright cells, which are the only cells that give rise to CFU-F (PMID: 17395729). Moreover, there is a close linear relationship between the number of CFU-F colonies counted manually after 14 days of culture and the number of CD271 (LNGFR)bright cells per milliliter of bone marrow aspirate (PMID: 22268519). Therefore, CD271 and MSCA-1 are valuable markers for the enumeration of MSCs by flow cytometry. 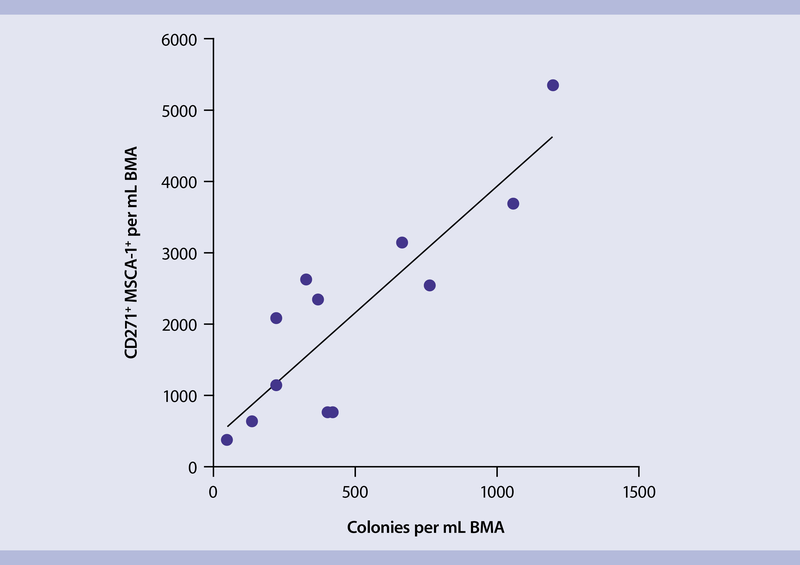 Linear relationship between the numbers of counted CFU-F colonies and CD271+MSCA-1+ cells per mL of bone marrow aspirate. R2 = 0.753, P = 0.0003, n = 12 donors. The MSC Enumeration Kit, human is designed for the quantification of MSCs in human bone marrow samples, based on the expression of CD271 (LNGFR) and MSCA-1 (W8B2). The kit allows identification of CD45+ leukocytes and CD271 (LNGFR)+MSCA-1 (W8B2)+ MSCs that are also CD45dim. 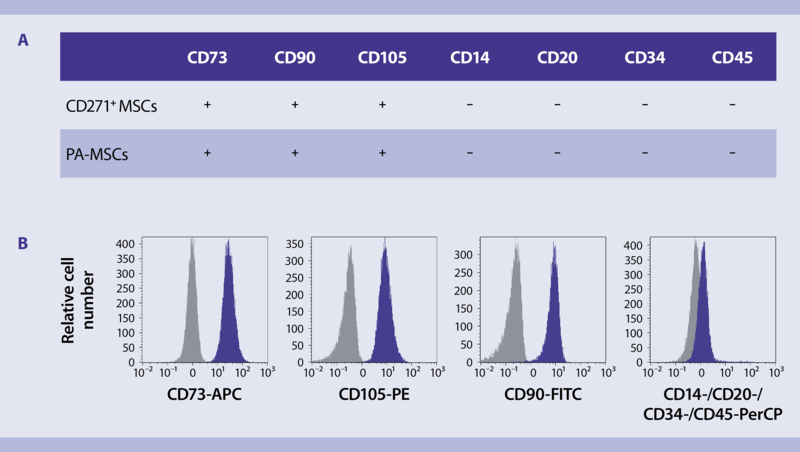 The MSC Enumeration Kit, human standardizes the identification and quantification of human MSCs from fresh bone marrow aspirate by flow cytometry and includes details on the appropriate gating strategy. Enumeration of MSCs by flow cytometry. Bone marrow aspirate (100 µL) was labeled using the MSC Enumeration – Staining Cocktail. After lysis of red blood cells, the remaining cells were analyzed with the MACSQuant Analyzer 10. Viable leukocytes were gated for CD45 and CD271 expression (top). This population was then further analyzed for Anti-MSCA-1 expression (bottom right). Gating was performed according to the corresponding isotype control (bottom left). Enumeration of MSCs by flow cytometry. Bone marrow aspirate (100 µL) was labeled using the MSC Enumeration – Staining Cocktail. After lysis of red blood cells, the remaining cells were analyzed with the MACSQuant Analyzer 10. Viable leukocytes were gated for CD45 and CD271 expression (top). This population was then further analyzed for Anti-MSCA-1 expression (bottom right). Gating was performed according to the corresponding isotype control (bottom left). A scientific poster describing the standardized quantification of MSCs by flow cytometry can be downloaded from the related resources panel to the right. Miltenyi Biotec offers a streamlined and standardized method that enables the fast, easy, and reliable identification and phenotyping of cultured MSCs according to standards defined by the International Society for Cellular Therapy (ISCT; PMID: 16923606). The MSC Phenotyping Kit, human includes all reagents necessary for MSC identification based on the expression of CD73, CD90, and CD105, and the absence of CD14, CD20, CD34, and CD45. The data sheet included in the kit provides details on the appropriate gating strategy. Phenotyping of MSCs according to ISCT standards. Cultured MSCs were stained with the MSC Phenotyping Cocktail (purple) or with the Isotype Control Cocktail (black). The fractions were analyzed by flow cytometry using the MACSQuant® Analyzer. Phenotyping of in votro expanded CD271+ MSCs and PA-MSCs. First protocols to isolate and expand MSCs from human tissues were based on media containing fetal calf serum (FCS). To meet increasing safety requirements from regulatory authorities, Miltenyi Biotec provides FCS-containing medium (StemMACS MSC Expansion Media), serum- and xeno-free medium (StemMACS MSC Expansion Media Kit XF), as well as serum-free, GMP-grade medium (MSC-Brew GMP Medium). All media enable reliable and reproducible expansion of MSCs from bone marrow, adipose tissue, and umbilical cord. 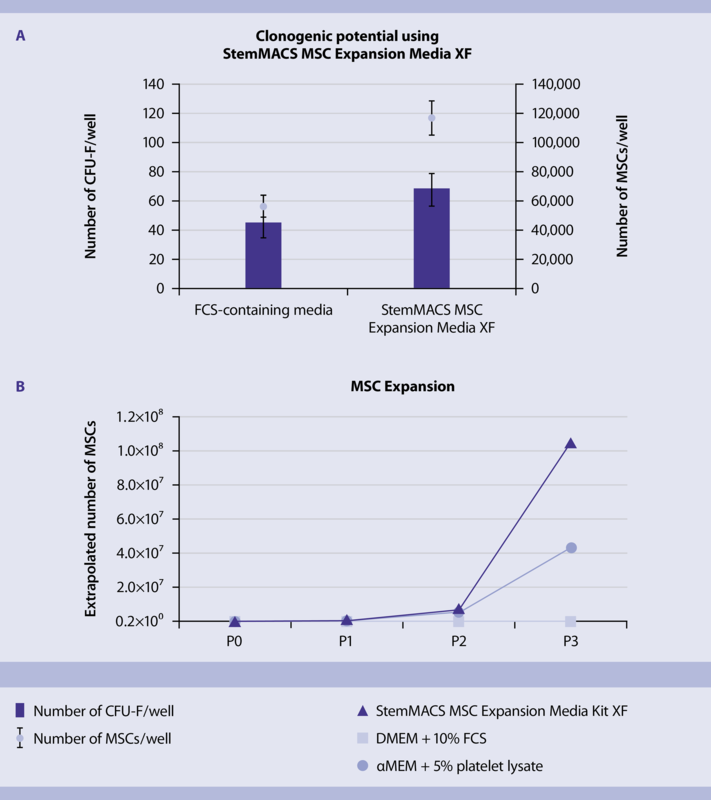 StemMACS™ MSC Expansion Media Kit XF is perfect for the direct isolation and expansion of human MSCs from various sources, including bone marrow and lipoaspirate. Its xeno-free composition enables fast expansion while maintaining differentiation potential and immunomodulation ability. MSCs cultured using the StemMACS MSC Expansion Media Kit XF show a superior expansion rate compared to other standard MSC culture methods. Comparison of expansion media for MSCs. 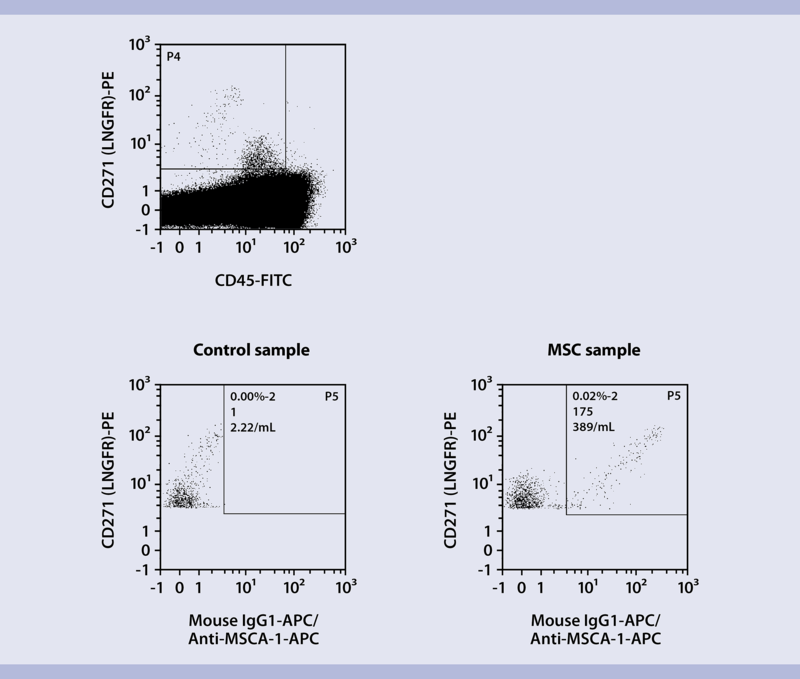 MSCs that were cultured using the StemMACS MSC Expansion Media Kit XF showed an increased clonogenic potential (A) as well as proliferation rate (B) compared to MSCs cultured in αMEM + 5% platelet lysate or in medium containing 10% FCS. Comparison of expansion media for MSCs. MSCs that were cultured using the StemMACS MSC Expansion Media Kit XF showed an increased clonogenic potential (A) as well as proliferation rate (B) compared to MSCs cultured in αMEM + 5% platelet lysate or in medium containing 10% FCS. Differentiation potential is a meaningful feature to qualify and define an MSC population. The propensity of MSCs to differentiate into adipocytes, chondrocytes, or osteoblasts is influenced by MSC origin. MSCs from bone marrow, for example, show greater potential to differentiate into osteoblasts than MSCs from umbilical cord. Increased age of donor and passaging of cultured MSCs also decrease the differentiation potential. StemMACS™ AdipoDiff, OsteoDiff, and ChondroDiff Media are optimized differentiation media for human MSCs from various tissue sources. The media support the analysis or quality control of the differentiation capacity of expanded MSCs. They also facilitate in vitro studies on the processes of MSC differentiation, including gene expression and protein profiling. MSC differentiation into adipocytes, chondrocytes, and osteoblasts. Adipocytes were stained with Oil Red O after cultivation of MSCs in StemMACS™ AdipoDiff Medium for 21 days (left). Chondrocytes were stained for aggrecan (red) and nuclei (blue) after cultivation of MSCs in StemMACS™ ChondroDiff Medium for 21 days (middle). Osteoblasts were stained with NBT substrate after cultivation of MSCs in StemMACS™ OsteoDiff Medium for 10 days (right). During the last few years, scientists have directed their attention towards the immunomodulatory potential of MSCs. It has been observed that MSCs derived from bone marrow suppress the proliferation of T cells (PMID: 11986244, 11823036). 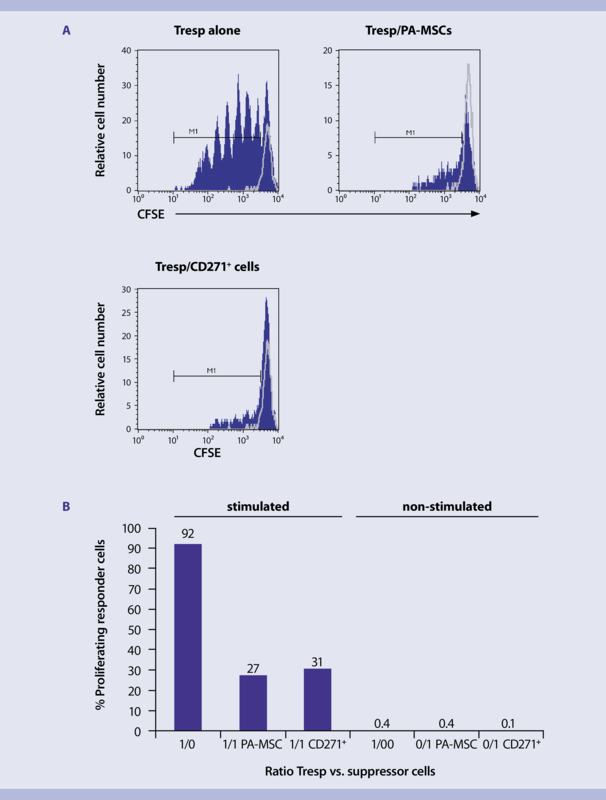 This function of MSCs can be analyzed using the MSC Suppression Inspector, human, which contains T cell stimulation reagents optimized for an MSC suppression assay. Principle of the MSC suppression assay. MSCs are cocultured with CD4+CD25– or CD4+ responder T cells (Tresp) in the presence of the polyclonal stimulus of the MSC Suppression Inspector. This T cell stimulation reagent is based on Anti-Biotin MACSiBead™ Particles pre-loaded with biotinylated CD2, CD3, and CD28 antibodies. Tresp cells alone show a proliferative response. Coculture with MSCs, however, reduces proliferation of Tresp cells. The suppression assay is performed with a dilution series of Tresp-to-MSC ratios ranging from 1:1 to 8:1. As additional control, Tresp and MSCs are cultured alone with and without the MSC Suppression Inspector. Cell proliferation is determined by 3H-thymidine incorporation or by staining with carboxyfluorescein succinimidyl ester (CFSE). Principle of the MSC suppression assay. MSCs are cocultured with CD4+CD25– or CD4+ responder T cells (Tresp) in the presence of the polyclonal stimulus of the MSC Suppression Inspector. This T cell stimulation reagent is based on Anti-Biotin MACSiBead™ Particles pre-loaded with biotinylated CD2, CD3, and CD28 antibodies. Suppression of T cell proliferation by PA-MSCs or CD271+ MSCs isolated by MACS® Technology. Tresp cells labeled with CFSE were cocultured with either CD271+ cells or PA-MSCs. Cells were stimulated by the MSC Suppression Inspector or left untreated. (A) Tresp cell proliferation was measured by flow cytometry as CFSE dilution (indicated by M1). (B) Data are presented as percentage of proliferating Tresp cells cultured in the presence of PA-MSCs or CD271+ cells in relation to Tresp cells cultured alone. Supression of T cell proliferation by PA-MSCs or CD271+ MSCs isolated by MACS® Technology.